Mark Hopley says Saints will have a 'hard look' at themselves after Saturday's defeat to Leicester Tigers at Welford Road. 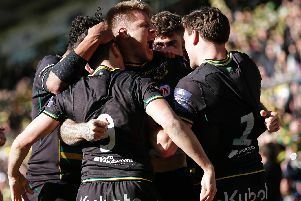 Jim Mallinder's men were beaten 27-20 in the Anglo-Welsh Cup clash, paying the price for a first-half performance that saw them go in 17-8 down at the break. Nafi Tuitavake and Rory Hutchinson did score late on to at least salvage a losing bonus point. But Saints are now second in Pool 1, three points behind Saracens with just one game, at home to Scarlets on Friday night, remaining. And Academy coach Hopley said: "Leicester kept hold of the ball very well and we conceded penalties to give them access into the game. "We will have a hard look at ourselves. We made too many mistakes and we'll do our best to put it right for next week." Hopley felt the first half, during which Saints conceded two tries, to Will Evans and Dom Barrow, cost the away side dear. He said: "We're disappointed with how we performed in that first half. We didn't get enough chance to put Leicester under pressure. "They came out hard and did a brilliant job on us in the contact area, and we were second best. "We put one, two phases together, but our discipline was poor and that gave them access into the game. "Eventually they get five metres out from the try line and we conceded tries. "The positive is that in the last 20 minutes, we showed what we could do. "When we get our detail right, when we get the breakdown right, when we get our tempo right, we're a handful. You saw that with the two tries we scored in the second half."